In 1975, when Hillis and Brian Silverman were in their sophomore year [at MIT], they participated in a class project to build something digital from Tinkertoys. The students sat down to play. One made an invertera logic device that converts a binary 1 signal to a 0 signal and conversely. Another made an OR gate; if either of the device’s two input signals happened to be a 1, then its output would also be a 1. 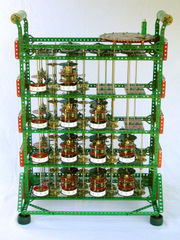 It quickly became clear to the students that Tinkertoys were ‘computation universal,’ the theoretical term for a set of components from which a fully programmable computer can be constructed. Theoretical possibility was one thing, the practical demands of money and time another. 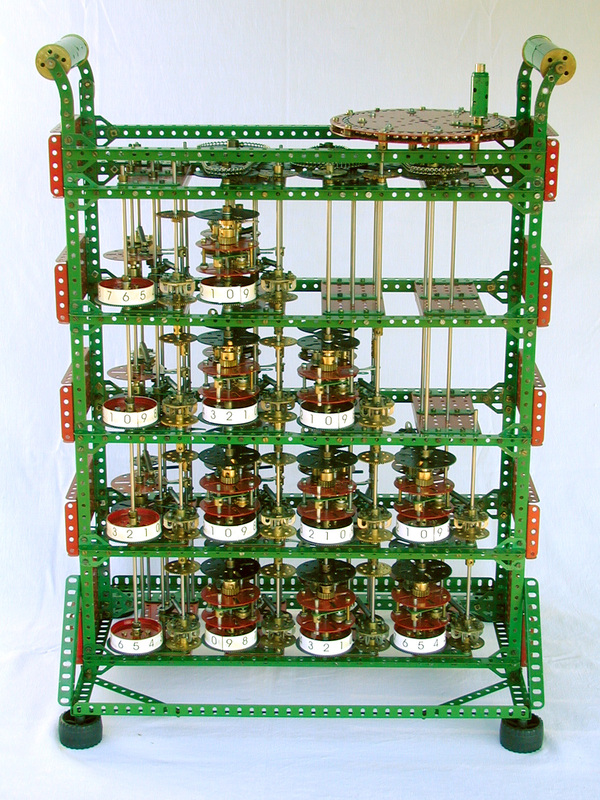 Mechanical Computing reports that “Tim Robinson has built a computer capable of solving polynomial equations — using Meccano.” What’s Meccano? Well, according to Meccano, a Short History, Meccano was a construction toy — think “Erector set” — designed by Frank Hornby of Liverpool, England, in 1901. It was know as Meccanics Made Easy then. In 1908 it became Meccano. After a long run, Meccano Ltd. went into receivership in 1979. Meccano is still available however. Their original French subsidiary, now an independantly owned company, still produces Meccano from a factory in France. Around 1990, Meccano France purchased the rights to the “Erector” trademark in the U.S.A. and started selling Meccano sets marked “Erector Meccano” in the U.S.A.. Exacto Ltd. of Buenos Aires, Argentina still produces Meccano. The Brio Erector Meccano sets are pretty impressive. 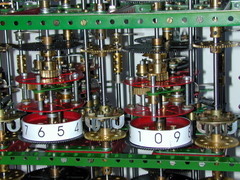 This model operates on principles very similar to Babbage’s original designs, though the constraints of using only standard Meccano parts inevitably mean some aspects of the operation are somewhat different. 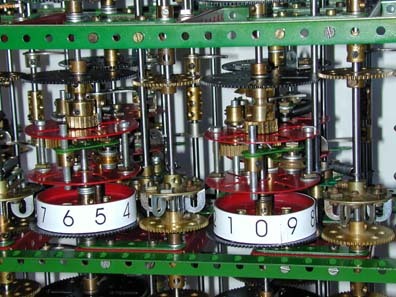 The model can handle decimal numbers with up to four digits, and up to three orders of differences — similar in scope to the fragment of the original Difference Engine #1 which Babbage actually realized in 1832. There is no reason in principle (other than the limited world supply of 21/2” gears and ratchet wheels!) why it could not be extended to arbitrary sized numbers and an arbitrary order of differences. Only two basic mechanisms are involved, those for the addition of individual decimal digits, and for the propagation of carries. The rest is repetition. The machine calculates reliably, producing a result about every 4 seconds — somewhat faster than they can be read off and written down. I have no doubt that if the Meccano of the 1920′s had existed 100 years earlier, Babbage would have been entirely successful in his quest. It may be amusing one day to attach a Meccano steam engine to drive the mechanism and therefore realize “computing by steam”. Before Microsoft. Apple. The Web. AOL. The Internet. Before everything, there was PLATO: the first online community. The network that time forgot. The birthplace of instant messaging, chat rooms, MUDs (multi-user dungeons), personal publishing, screen savers, flat-panel plasma displays, one of the first spell-checking/answer-judging mechanisms, and countless other innovations. The PLATO system, started way back in 1960, was developed as a technological solution to delivering individualized instruction, in thousands of subjects from algebra to zoology, to students in schools and universities across the nation. As the system grew and evolved, it became, pretty much by accident, the first major online community, in the current sense of the term. In the early 1970s, people lucky enough to be exposed to the system discovered it offered a radically new way of understanding what computers could be used for: computers weren’t just about number-crunching (and delivering individualized instruction), they were about people connecting with people. For many PLATO people who came across PLATO in the 1970s, this was a mind-blowing concept. Despite its primitive nature, this early computer was much more pleasant to use than the monster mainframe I was subjected to a few years later, when I started at the university. The early, simple computer couldn’t do much, though I did design a few text-based games for it. Still, it was a single-user computer — basically a PC the size of a room. When you used it, you had total control of the machine and knew everything it did, down to the spinning and whirring of the punched tape. Although the bigger, newer mainframe had an actual CRT (cathode ray tube) screen, it also had obscure commands and horrible usability. Worst of all, it was highly alienating, because you had no idea what was going on. You’d issue commands, and some time later, you might get the desired result. There was no feeling of mastery of the machine. You were basically a supplicant to a magic oracle functioning beyond the ken of humankind. Today’s video games with all their bells and whistles had to begin somewhere, and that somewhere was your living room, in, say, 1982. 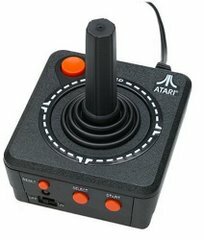 Remember Asteroids, Missile Command, and Breakout? How about Centipede, Adventure and Gravitar? This TV Games Video System — just a “smart” joystick and nothing else — delivers 10 classic games in all. The joystick has the typical up-down-left-right movements, and single functions to select, start, and reset games. Front-and-center is a big, red fire button (“fire” being the only way to propel or kill things back then). The unit hooks up to your TV via those yellow and white AV output jacks (which should already be on your TV or VCR), and requires 4 “AA” batteries. The W54 warhead used on the Davy Crockett weighed just 51 pounds and was the smallest and lightest fission bomb (implosion type) ever deployed by the United States, with a variable explosive yield of 0.01 kilotons (equivalent to 10 tons of TNT, or two to four times as powerful as the ammonium nitrate bomb which destroyed the Alfred P. Murrah federal building in Oklahoma City on April 19, 1995), or 0.02 kilotons-1 kiloton. A 58.6 pound variant — the B54 — was used in the Special Atomic Demolition Munition (SADM), a nuclear land mine deployed in Europe, South Korea, Guam, and the United States from 1964-1989. So we’re six weeks into filming HITCHHIKER’S GUIDE TO THE GALAXY and the powers that be (PTB) thought it would be a good idea to kick it off with an interview with me, the screenwriter, since that is, after all, where this incarnation of the film started. So I decided to interview myself because a) I think I?ll be harder on myself and know what sort of questions an interviewer might ask and b) no one has asked to interview me. And why should they? Who am I? “Not Douglas Adams” is the answer that concerns most people. So with this in mind let?s proceed. Obesity is becoming the world’s biggest health problem, experts said on Thursday, as they called for the newly expanded European Union to make fighting the flab a top priority. They are pushing for controls on marketing and television advertising for children and a labeling scheme to distinguish which foods should be eaten as part of a healthy diet. ‘Obesity has now become a strong candidate for being the number one health problem mankind is facing,’ said Professor Claude Bouchard, president of the International Association for the Study of Obesity. Nazi “nutritionists mounted a frontal attack on the Germans’ excessive consumption of meat, sweets, and fat, and argued for a return to ‘more natural’ foods such as cereals, fresh fruit, and vegetables.” Repudiating the public/private distinction central to liberal societies and liberal political philosophy, the Nazis declared that the personal was indeed the political. One slogan declared: “Nutrition is not a private matter!” Each person’s diet was a matter of state concern, for the state was responsible for the health of the body politic. Hitler himself declared that “reforming the human lifestyle” was “far more important” than anything else he might accomplish. Hitler loathed obesity and launched campaigns against it both within the SS and in the polity at large. Once you find Hitler’s ringing endorsement of a progressive cause — vegetarianism, fitness, eugenics, gun control, whatever — it’s entirely too tempting to use it as an argument against that cause. The giant fungi stands 45 centimeters (18 inches) high and has three tiered caps on top of a broad stem. The bottom cap measures one meter across, the second one 60 cm and the top one is 24 cm wide, Botaba said. Perhaps a long-lost Smurf tribe lives in the Republic of Congo? Applications to business schools are down this year — at least in America, where management education was born and where business schools still award about 85% of the world’s business degrees. Kenneth Dunn, dean of Carnegie Mellon’s Tepper School of Business, says that applications for the full-time MBA programme, one of the country’s best, are about 30% lower than this time last year. Allan Conway of the University of Calgary, and programme director of the MBA Roundtable, an industry body, estimates that applications this year for MBA programmes in America are down by between 15% and 25% on 2003. And in spite of what you read in the paper — outrageous gasoline prices entered into Google gets you 15,000 links — its current inflation-adjusted price of $2 a gallon is about its median price over its 85-year existence, and with the exception of the 1980s spike, it has been steadily declining over the decades. Burning gasoline is very much cleaner than it was 20 years ago too. According to the Environmental Protection Agency, lead emissions have nearly disappeared; carbon monoxide is down 62%, sulfur dioxide 52%, nitrogen dioxide 24% and ground-level ozone (smog) 18%. The Islamic public-relations offensive is focused on proving that the West is corrupt and offers no improvement on the despots in charge throughout the Islamic world. At the same time, Al Jazeera isn’t examining Vladimir Putin’s war against Muslims in Chechnya. All of Chechnya is one big Abu Ghraib, but the Islamic world pays scant attention to the horrible crimes there because Mr. Putin shares their distaste for liberal democracy. The war is not about defending Muslims; it is about Western civilization and America as its representative. As of today, about 800 soldiers have died in Iraq. About 290,000 U.S. soldiers were killed in World War II; about 59,000 died in Vietnam. “Anything you inhale, you also swallow,” Huffnagle said in a statement. Nazi nutritionists stressed the importance of a diet free of petrochemical dyes and preservatives; Nazi health activists stressed the virtues of whole-grain bread and foods high in vitamins and fiber. Many Nazis were environmentalists; many were vegetarians. [Including Hitler himself.] Species protection was a going concern, as was animal welfare. [Reichsmarschall Hermann G?ring barred vivisection in all scientific work noting the "unbearable torture and suffering in animal experiments" and he threatened to commit to concentration camps "those who still think they can treat animals as inanimate property."] Nazi doctors worried about overmedication and the overzealous use of X-rays; Nazi doctors cautioned against an unhealthy workplace and the failure of physicians to be honest with their patients — allowing momentous exclusions, of course, for the ‘racially unfit’ or undeserving.